A similar shot to a previous posting of Bastwell, only there's no signage above the doorway of the Bastwell Hotel on this one. Only guessing again at the date, but would think it's around 1900, perhaps a few years later. 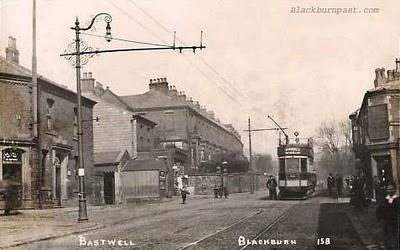 I don't think that this view would look much different today, apart from the cast iron lampost's carrying the power supply for the Trams (And by the looks of it a Gas Lamp as well, Jeez that must have been a bit risky !!) as well as the wooden buildings jutting out from just beyond the Bastwell Hotel,and obviously the Traffic Lights which are there now. Notice how the Tram Driver is posing at the front of his Tram. I bet you wouldn't get a modern day Bus Driver doing that. Someone once mentioned that the wooden building you mention John was a police hut? I think it was Barbara Whewell that mentioned it John. It was way before my time. I think she was talking about the 1940's - 50's. The one at Copy Nook was more of a police station than just a 'hut'. The one at Billinge End (which is still there) was a similar size to the one at Brownhill roundabout. Not sure what they were used for. They had a phone in them and an office area (well a desk). I suppose bobby's on the beat used them as rest areas too, for breaks etc. They probaby had a toilet in them and provided shelter from the elements, when necessary. I think there was a 'hut' at Griffin as well, at one time. The wooden building I remember well as a lad growing up round there in the 1960's. .. It was used as a temporary newsagents during wakes week and adjacent to it was a smaller brick built structure probably 6ft X 6ft with a police sign above it and a navy blue door....was always locked.